This illustrated beginner’s guide to personal finance distills essential information into small, easy-to-follow steps to help you get your finances in order. With the help of this guide, you’ll learn how to make good investments, save for big things like a house or college tuition, budget, and more! "Want to better manage your money? This book will show you how. 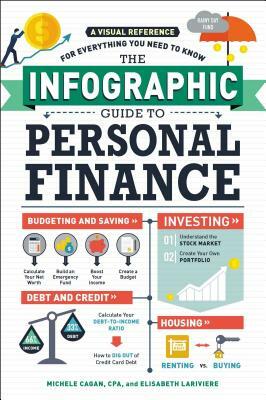 Visually engaging … .If this is your style, then you’ll like … The Infographic Guide to Personal Finance. Throughout this reference guide are bold, colorful illustrations covering budgeting, saving, spending, debt, credit, investing and housing. If you’re looking for a way to introduce financial concepts to a young adult, this book will do the trick … .It simply delivers a tough topic in graphically appealing, digestible bites."